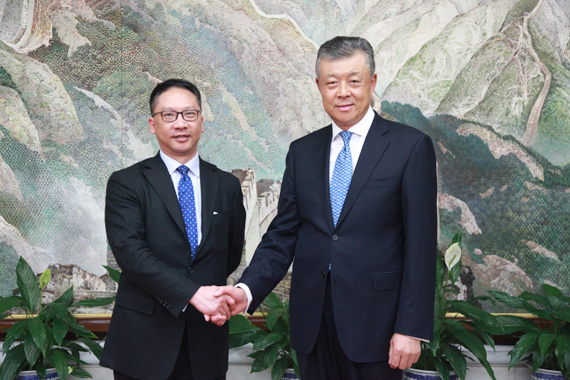 On May 26, 2017, Ambassador Liu Xiaoming met with a visiting delegation led by Mr. Rimsky Yuen Kwok-keung, Secretary for Justice of Hong Kong SAR Government, at the Embassy. Ambassador Liu briefed the guests on the current China-UK relations, and said that this year marks the 45th anniversary of ambassadorial relations between China and the UK, and it is also a year for consolidating the "Golden Era" of China-UK relations. The two countries have made new achievements in their pragmatic cooperation in various fields. With Chancellor Hammond's attending the Belt and Road Forum for International Cooperation in China as Prime Minister May's personal envoy, and people from all walks of life in the UK taking a positive attitude towards participating in Belt and Road cooperation, the Belt and Road Initiative is expected to be a new highlight of China-UK cooperation. Ambassador Liu noted that this year marks the 20th anniversary of Hong Kong's return to China. The past two decades have witnessed the successful practice of "One Country Two Systems", and Hong Kong continued to enjoy prosperity and stability. Hong Kong has its obvious strength in finance, legal services, and other areas. 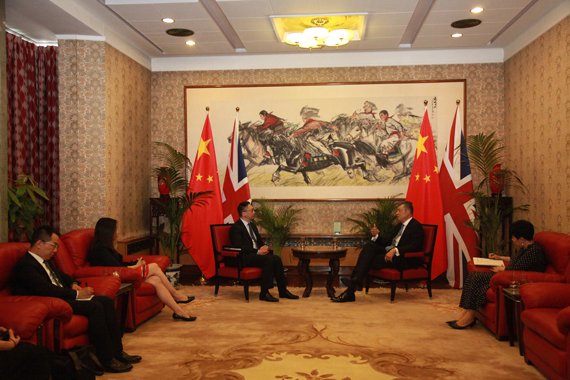 The Ambassador expressed the hope that Hong Kong will seize the opportunity brought by the Belt and Road Initiative to deepen the exchanges and cooperation with the UK in the fields of trade and culture, and continue to serve as a bridge for China-UK relations. Mr. Yuen said that his current visit on the occasion of celebrating the 20th anniversary of Hong Kong's return to China allows him to update the people from all walks of life in the UK on the achievements Hong Kong has made during the past twenty years, with an emphasis on the significance of the practice of Basic Law alongside the Common Law in maintaining Hong Kong's prosperity and stability. He also said that Hong Kong will seize the opportunities of the Belt and Road Initiative to explore win-win cooperation with the UK in legal services, international arbitration and other areas.